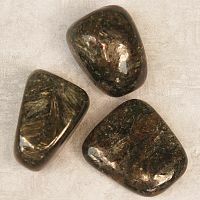 - A set of three tumbled astrophyllite gemstones. Stones will vary in size and shape, but most are in the range of 3/4" to 1 1/8". 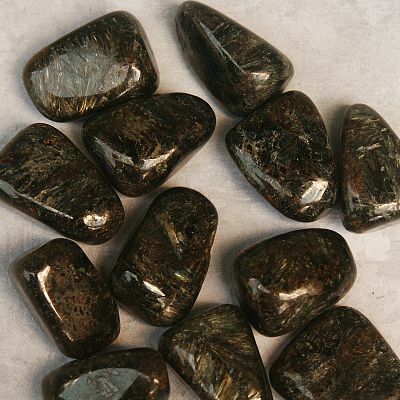 These relatively rare stones are dark, with flashes of yellowish-brown needle-like inclusions. Its metaphysical properties can be summed up by the phrase "Know thyself". It aids in identifying one's strengths and weaknesses, and using that knowledge when faced with important life decisions. Do you have any other questions about our Astrophyllite?